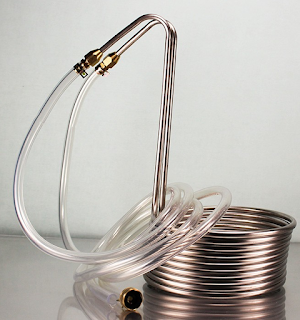 This past Christmas I received the Silver Serpent stainless steel immersion wort chiller. I've had the opportunity to use it a few times now, so it seemed appropriate to share a review with readers of Begin Brewing. There are twist ties on the coils that I removed, not certain if they were food safe or temperature safe. There are no instructions in the box with the chiller to tell you whether to remove them or not. I'm currently doing all my brewing in our home kitchen. Our stove is fortunately powerful enough to bring a 5-gallon batch of beer to a rolling boil, so it's worked well. The unfortunate problem is that the faucet on our kitchen sink is designed without an aerator, so there's no way to attach a garden hose fitting adapter to it. My solution to the problem was to visit a local aquarium store and purchase a submersible aquarium pump for about $30. Then, I tangle the "hose fitting end" into the drain, attach the other end of the tube to the outlet on the aquarium pump, fill the sink with cold water, and start the pump. The pump pushes cold water from my sink into the chiller and out the other side. This is the opposite direction from the design, but shouldn't have a negative effect on heat transfer as far as I know. When I used the Silver Serpent in the winter on a 4 gallon boil I made in January, when our tap water was about 53 degrees Fahrenheit coming out of the tap, the wort chilled to yeast pitching temperature in around 25-30 minutes. A few weeks ago, I brewed a batch of Belgian Tripel using the Brewer's Best extract based kit (which I'll talk about in a future post). This 5-gallon high-gravity beer took almost 75 minutes to chill to yeast pitching temperature using the tap water (measured at 59.3 degrees Fahrenheit) and aquarium pump. That was longer than I expected, but still much faster than I was ever able to chill my wort before. As you can see above, the temperature dropped about 10 degrees every 5 or 6 minutes. With colder water on the incoming side, you'd probably see a faster decline in temperature. Cleanup of the Silver Serpent is easy. You remove it from the brew kettle, rinse it thoroughly, and brush off any residue from the brew kettle. Once dried, it's ready to use again. 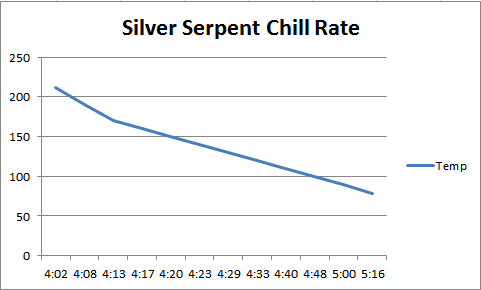 Being made of stainless steel, the Silver Serpent is a little more expensive than some of its copper competitors. I've heard that you may see corrosion and other issues with the copper chillers, so I thought the stainless made a nice alternative. It looks as good now as when I got it six months ago. Can adding amalyse help make better beer? Recently, I saw a recipe for a 21% ABV all-grain brew. The recipe calls for a whopping 31 pounds of grain and four ounces of hops, along with enzymes to help push the mash along. The enzyme (Beano) specified in the recipe is measured in terms of tablets. I wanted to know how to use Amylase instead, since I had that on hand. Amylase is an enzyme that breaks down two components of starch and complex carbohydrates to form maltose and glucose sugars. Amylase improves conversion efficiency and time by splitting barley starch molecules into partially-fermentable dextrins and maltose. Given enough time, amylase can dismantle the dextrins to maltose, glucose, and smaller dextrins. When fermentation begins, yeast will break the sucrose into glucose and fructose. It then consumes (more or less in order), the glucose, the fructose, the maltose, and finally the maltotriose. The dextrins will not be consumed. By helping to break the starches into maltose, glucose, and dextrins, Amylase makes more of the starch in the grain consumable by the yeast (resulting in a more complete fermentation and a higher alcohol content to the beer). So, how do we use Amylase properly? I wasn't sure, so I did some digging. Amylase can be added to a stuck fermentation to push it along, but it's best suited to be added during the mash. Enzymes in play during mashing will stop working at 168 degrees F (Fahrenheit), and this includes Amylase. Amylase works best at 147-153 degrees F.
The recommended amount is 1/2 ounce for each 10 pounds of grain in the mash. If your fermentation is stuck, and/or your recipe included a lot of adjunct sugars, adding amylase to the fermenter (dissolved in sterilized and cooled water) can "unstick" it. The recipe I'm considering brewing (a modified and smaller batch of the 21% beer above) has 8 pounds of grain in it. That's close enough to 10 pounds that I'm planning to put a half-ounce of Amylase in my mash water and use the iodine test to make sure it's all converted. I'm also going to add yeast nutrients in the boil and will oxygenate each incremental wort addition in the fermenter to keep the yeast happy. Hopefully that, combined with feeding the yeast the full batch of wort a little at time, will yield a brew in the 21% or higher ABV range. More on that if and when I decide to brew this thing! How can I be sure my mash is really finished? If you are new to all-grain brewing, or you're brewing a higher-gravity beer than usual and want to be sure the mash has converted all the available starches to sugars, here is an inexpensive but effective way to do it. Before brewing, go to your local drug store and pick up a bottle of Tincture of Iodine. That's the stuff often placed on cuts as an antiseptic. When you think your mash may be finished, extract a small sample from it. 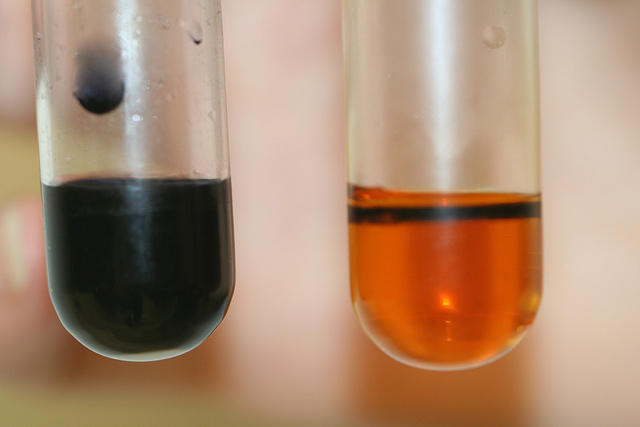 Add a drop of iodine to the sample. If you see the sample turn dark purple or black, there is still starch in the mash to be converted. If there is little to no color change, your starches should be fully converted to sugars. Time to move on to the boil! Below is a picture of what the test results look like. The tube on the left contains starch and has turned a dark color. The one on the right does not. If you're a fan of barrel-aged beers and also a homebrewer, you've probably wondered what it would take to get those great oak and liquor barrel flavors into your own brews. While oak barrels and used liquor barrels aren't too hard to find, it's not necessary to actually age your beer in a barrel to get that same flavor. Bourbon Barrel Chunks: You can find these in grilling supply stores, homebrew shops, and other retailers. These are large chunks of barrels used to age bourbon, sliced into chunks. Although often sold as a wood to be used for grilling meats and vegetables, it works just fine for brewing. These can be used to make a liquor tea or oak tea, which can be added at bottling time. These can also be added during the aging phase once fermentation has finished. I've even added them during the boil and left them in the beer during fermentation and aging. Oak Chips, Cubes, and Spirals: These are all basically pieces of oak in different shapes. They're available at grilling, homebrew, and wine making shops. Chips are smaller pieces that offer lots of surface area to impart flavor quickly to the beer. Cubes take a little longer to deliver oak flavor, but are easier to remove from beer than chips can be. Spirals are long rods of oak carved into a spiral shape that combines the flavor transfer speed of oak chips with even easier removal than cubes. These can be used to make a liquor tea or oak tea, which can be added at bottling time. These can also be added during the aging phase once fermentation has finished. Oak Essence: This is sold in beer and wine brewing shops. It's a liquid containing oak flavoring. It can be added during bottling, and allows you to adjust the level of oak flavoring to suit your taste or recipe requirements. Oak Powder: Similar to oak essence, this powder can be added at bottling time to add just the right level of oak flavor to your brew. It's available at some brewing and wine making shops. Liquor Tea: To make this, you begin by pouring the desired liquor (rum, bourbon, etc.) over the oak in a sealed container for a week or so. The liquor can be watered down if desired. The liquor will soak up flavors from the oak, and is added to the beer at bottling time in a manner similar to the oak essence or powder. Oak Tea: In this case, you put the oak in a pan with just enough water to cover it. This is boiled for 10 to 15 minutes, which sterilizes the water and extracts flavor from the oak. The water is then added at bottling time in a manner similar to the oak essence or powder. Oak Aging: Steam the oak for 15 minutes to sterilize it. Add it to the fermenter after the primary fermentation is finished and leave it in place during aging. Aging can take weeks or months depending on the level of oak flavoring desired. Of course, the obvious "step up" from these options is to acquire an actual oak barrel and age your beer in that barrel. If you're thinking about adding an oak barrel to your brewing equipment collection, do some research first. Not only are they a significant investment in terms of cost, they have different cleaning and storage requirements than a carboy or fermenting bucket. Their special requirements also mean that eventually they'll acquire enough wild yeast and bacteria to begin having an impact on the beer. The methods discussed earlier don't have these disadvantages because the wood is generally discarded after each use. The best way to maintain your barrel is to be constantly aging a new beer in it. This ensures that there is enough liquid in contact with the wood to keep it conditioned. If the wood gets too dry, the barrel begins to develop gaps that can cause leaks and contamination. Cleaning means filling it with warm water to wash out any trub and kill off any microbial contamination. Don't use chemicals, as these can soak into the wood and transfer into the beer. (Going in on a barrel with a few home brewing friends and passing it around is a good way to keep it in use!) Professional breweries use a steam injection system. To store a barrel, flush it with warm water to clean it, as noted above. Fill the barrel with hot water and let it soak for at least an hour. Remove the water, insert the bung to seal it, then store the barrel in a cool, dry place. Ideally, you'll inject carbon dioxide into the barrel periodically to retard the growth of microbes. At some point, though, the microbes and wild yeast will pretty much make the barrel unusable. If I could acquire a good bourbon or rum barrel inexpensively, I'd certainly pick one up and do a few barrel aged beers in it. However, given the fact that I'm not constantly brewing a new batch of beer, I think a barrel would be a bad investment for me. It would probably pick up too many wild yeast and bacteria before I would get enough use out of it to justify the cost. I'll probably stick with the bourbon barrel chunks I bought at Jungle Jim's in Cincinnati and use those with oak teas, bourbon teas, or directly in the boil to impart the same flavors without the expense and nuisance of a barrel. Naturally, you should do what's best for you.